Oooh Wah Wah, Bridge Builders Alumni! Welcome back! As alum, you’re part of a proud and growing group of leaders who are building bridges in Memphis, across the United States, and around the world. The Bridge Builders program is turning 30 in 2018! To celebrate this incredible anniversary, we’ve put together 30 ways for you to reconnect with BRIDGES and your fellow alumni throughout a year-long celebration of diversity, leadership and community action. And we want you to update your contact information to make sure we have your current info (your parents probably don’t want to receive your alum invites!). Please help us connect with other alumni by encouraging them to update their information as well. Keep checking this site for additional celebration details, and please help us to spread the word to other BB alums! Follow the Bridge Builders Alumni Association on social media. Reconnect with other alums and stay up-to-date on all our 30 for 30 activities by following us on Facebook. Sport your BB swag with pride. To celebrate our 30th year, our Bridge Builders alumni committee is creating special vintage-style t-shirts, a 30th anniversary commemorative shirt, and other cool BB alum swag! We’ll have items for sale at the upcoming BB 30th events, but you can also purchase your items directly online! 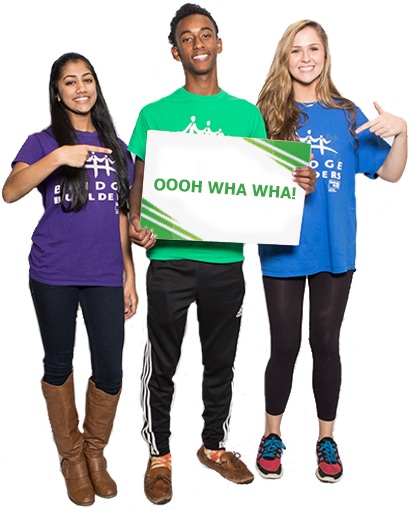 Come in to the Jim Boyd BRIDGES Center and help us call brand-new Bridge Builders to congratulate them on being accepted to the program for the 2018-19 school year. CLICK HERE TO SIGN UP. Serve on a Community Action project alongside current Bridge Builders. Details coming soon! CLICK HERE TO SIGN UP. You must register for this event through the National Civil Rights Museum. Also, let us know you’re going by RSVPing HERE. This event is coordinated by LeMoyne-Owen College and is a re-enactment of student-led service that took place the day after the assassination of Dr. King. RSVP HERE. Join in the nostalgia and post your oldies but goodies pics from Bridge Builders. See how many of your fellow Bridge Builders you can tag, and be sure to use hashtags #TBT, #BB30 and #BridgeBuilders. Mingling, eating, drinking, dancing and re-enacting your favorite “BB Tonight” skits! Sign up for the event HERE. Want to star in a classic BB Tonight Skit? Sign up HERE! Attend this year’s Bridge Builders Graduation. Come help us welcome the newest cohort of BB alumni into the family! Please sign up HERE. Get your hands dirty at our BB Tree Planting Community Action. April 2018; exact date TBD. Check back soon for details! Enter our “Love In Any Language” video competition. Raisin is a musical adaptation of Lorraine Hansberry’s revolutionary “A Raisin in the Sun.” Set in segregated 1950s Chicago, Walter Lee Younger and his mother Lena fight over the spending of insurance money. He wants to start a business with friends, while she is eager to move the family out of the south side and into Clybourne Park. Raisin depicts a black family’s struggle in the face of change. This event is for BB alums only (but you can bring a plus one, too)! Seating is limited, so click here to reserve your free tickets now! Unwind at the alumni wine & cheese reception from 5:00 – 6:00 p.m., then we’ll have special alumni seating and recognition during the induction ceremony from 6:00 – 7:00. Sign up HERE. Come to YOUnified, our end-of-summer celebration. We need your help as a volunteer for YOUnified 2018. Event volunteers will assist on the day of the event in various roles. You’re also invited to bring family along for this intergenerational, interactive event coordinated in collaboration with current Bridge Builders! Get your heart pumping at Alumni Climb Night. Sign up coming soon. Bring your spouse, significant other or friend along to climb the indoor rock wall at BRIDGES! RSVP HERE. Dust off your Sunday best for the BB 30th Anniversary Awards Event. Award nominations closed Friday, September 7 and we thank all of you that submitted! Mark your calendars now for this special ticketed event (only $30/person) featuring dinner, drinks, dancing and awards honoring outstanding alumni! Stay tuned for more details and a link to purchase tickets. The 30th Anniversary Planning Committee is also looking for a team of special hosts for this event. For $300, you’ll get 10 tickets to share with your alumni friends, your name listed on the event invitation, and opportunities to help make this event amazing! For more information about serving on the host committee, contact Rachel Cheek at bridgebuildersalumni@bridgesusa.org. This is a volunteer opportunity to help our CHANGE Fellows, 40 Bridge Builders youth organizers working on issues from youth voting and civic engagement to youth justice reform, hone and perfect their strategic plans for the 2018-19 school year. Fall 2018; dates TBD this summer. Enjoy a Grizzlies game with your fellow Bridge Builders alumni! Fall 2018; details coming soon. Give back with the $30 for 30 campaign. This program helped you become the person you are today. Now we need your help to make sure future generations get the same life-changing Bridge Builders experience. Look out for details this fall about how to support BRIDGES through our newest giving campaign.